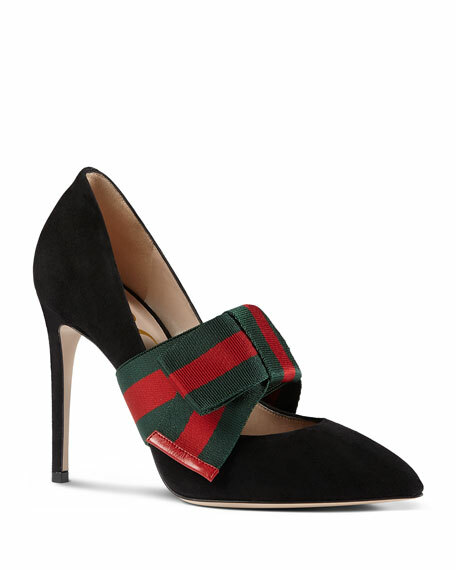 Gucci "Sylvie" suede pump with removable green/red/green web strap. 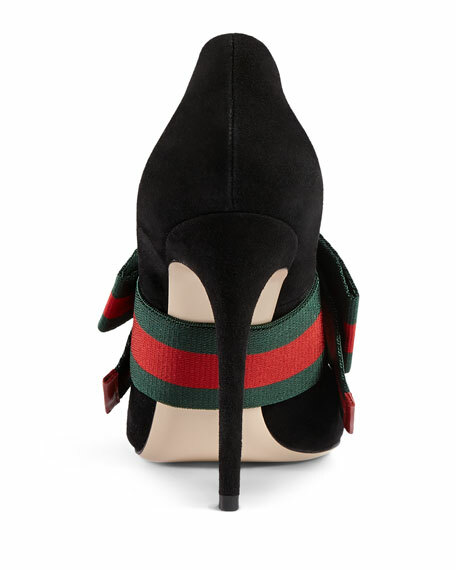 Gucci pump in soft Malaga kidskin leather, finished with two pearly-studded patent bows and logo-web instep band. 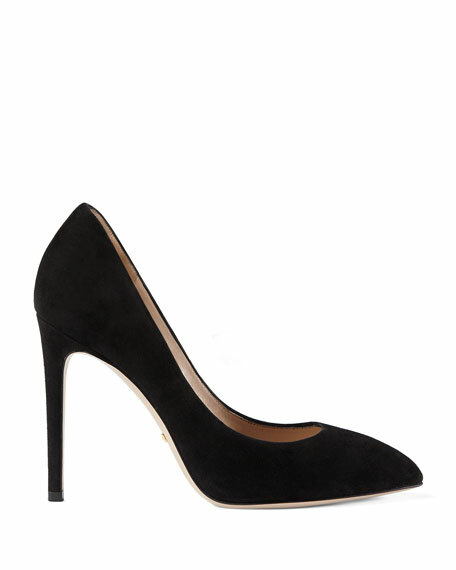 2.3" covered kitten heel. Square toe; notched vamp. Slingback with adjustable crystal buckle. Floral-print leather lining. Made in Italy. Fit: Runs true to size. Gucci "Houdan" leather loafers with horsebit hardware. 3.3" covered block heel with 1" platform; 2.3" equiv. Square toe. Notched vamp. Gucci "Houdan" leather loafers with horsebit hardware. 3.3" covered block heel with 1" platform; 2.3" equiv. Square toe. Notched vamp. Slip-on style. Leather lining and sole. Made in Italy. Fit: Runs true to size. 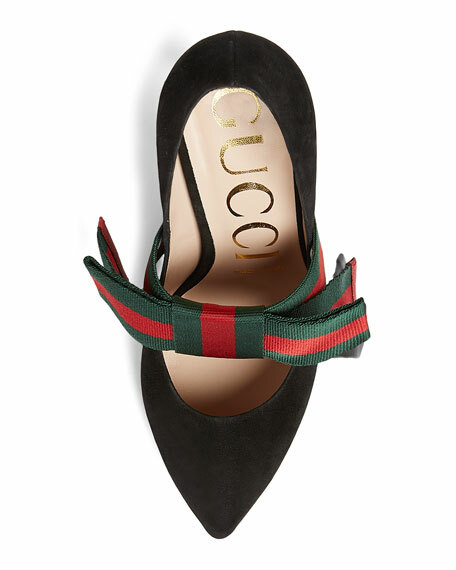 Gucci leather pump with multicolor jeweled GG embellishment. 1.8" polished wooden heel. Pointed toe. 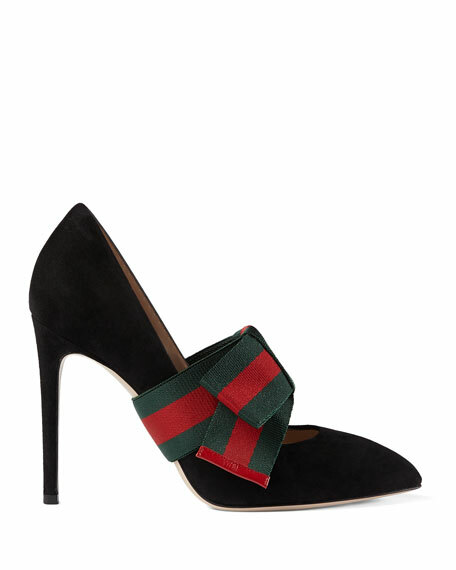 Thin, buttoned strap over toe. Cutout sides. Heart motif at the insole sewn directly into the leather. Leather lining and sole. Made in Italy. Fit: Runs true to size.